The Milwaukee Brewers got a solid pitching outing from lefty Randy Wolf, and came up with timely hitting to come back for a 4-2 win over the Cardinals and tie the NLCS up at two games apiece. Wolf gave up two solo home runs. The first came in the bottom of the second when Matt Holliday popped one up down the right field line that looked like it might go foul. However, it just cleared the wall to the left of the fair pole to put the Cards up 1-0. The next inning Allen Craig, inserted into the lineup for Lance Berkman who has struggled against Wolf, took an low outside pitch to right center into the Cards bullpen for a 2-0 lead. Cardinals starter Kyle Lohse was strong the first two innings, but ran into a little trouble in the third giving up a double to Wolf and hitting Nyjer Morgan, but the Brewers couldn’t capitalize until the fourth. Prince Fielder and Jerry Hairston Jr. doubled around an out and Hairston Jr. scored on a single from Yuni Bentancourt to tie the game at 2-2. In the fifth, Morgan doubled and Lohse was lifted for Mitchell Boggs who gave up a single to Ryan Braun as Milwaukee grabbed a 3-2 lead. The Brewers added a run in the sixth when Rickie Weeks scored from third on an error by second baseman Ryan Theriot. 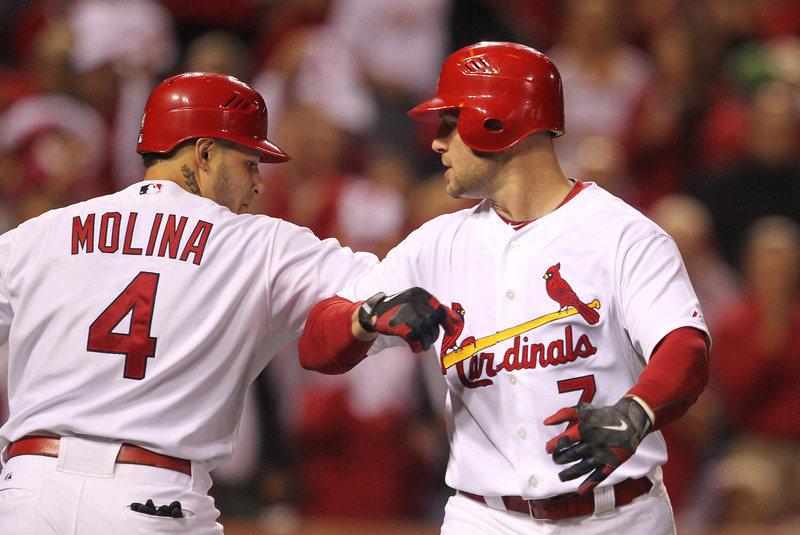 After the two solo homers, the Cardinals didn’t mount much of any attack against Wolf. He allowed six hits and a walk while striking out six. Francisco Rodriquez and John Axford pitched the last two innings to close out the game. Jaime Garcia will face Zack Greinke in game five. Greinke has struggled in the post season, but if he’s on and the Cardinals drop Friday’s game, going back to Miller Park needing to win two would be a tall order.